Two seemingly unconnected issues came up this week. First, the Chinese central government announced the cancellation of unlimited multi-entry permits for Shenzhen residents traveling to Hong Kong. Instead, mainlanders will receive one single-entry permit per week. Second, Taiwan was not accepted as a founding member to the Chinese-led Asian Infrastructure Investment Bank. These two issues both emerged from rather complicated backgrounds, but they have one thing in common: a connection to populism. Certainly there are a number of reasons for the cancellation of multi-entry permits: for example, a rising cost of living in Hong Kong exacerbated by increased demand. Plus, there are unfortunate cultural conflicts between Hong Kong people and mainland visitors. Parallel traders from mainland China intensified these issues, leading to more estrangement and even occasional confrontations, particularly between local radical groups and visitors from the mainland. It’s true that there are issues and problems with the current policy. But questions remain as to whether some Hong Kong student activists and especially those radical groups are really trying to protect democracy as they claim. The cancellation of multi-entry permits is just as normal as instituting traffic controls during rush hour, and reasonable mainlanders should fully understand the difficulties of Hong Kong people. However, certain issues and problems in the past months deserve deeper attention — things are not as clear-cut as some people want them to seem. For example, “civil disobedience,” even by Western standards, should be peaceful, non-violent, and moderate; that reflects the spirit of rule of law. But the real situation in Hong Kong was another story. The“Occupy Central” movement threatened to split Hong Kong society. More recently, radical students inexorably shouted abuse at a mother from the mainland and her little girl (who had nothing to do with parallel trading), and a few student activists registered the Hong Kong independence Party in London. Is this true democracy, or narrow populism? In Taiwan, populism has grown since the 1970s, along with Taiwan’s democratization process. Populism often plays a role in the political issues that decide Taiwan’s elections. Issues like a person’s ethnic group or family origins (ie mainlander or local) often get pulled into the debate over whether one loves Taiwan or not. 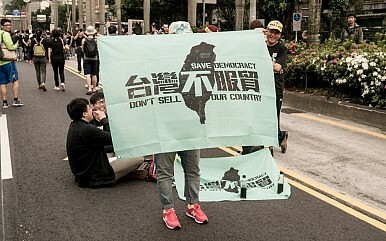 People are also assigned to the categories of supporting “unification” or “independence.” These passionate slogans represent splits in Taiwan’s society, with certain groups and political elites uncompromisingly upholding and highlighting Taiwan’s local and independent identity (as defined in opposition to mainland China). This dynamic was particularly on display in the 2004 presidential election. More attention has been paid to Taiwan’s economy and the general public’s welfare in recent years, and agreements with mainland China could be economically beneficial to Taiwan. However, whenever the subject of the mainland comes up, certain students and radical groups become confrontational and claim that they are protecting democratic values and Taiwan’s local and independent identity. We saw this with the the “Sunflower Movement.” In fact, mainland China made significant concessions to Taiwan in the Cross-Strait Services Trade Agreement (much more than WTO regulations allow). Beijing promised to open 80 sectors to Taiwan; by contrast Taiwan would opens 64 sectors. However, in opposing the CSSTA, populist fever ran high again. For days, young students occupied Taiwan’s legislature, claiming they were defending democracy. This time, when Taiwan decided to join the Asian Infrastructure Investment Bank, some young student groups once again stood up to protest the decision. They claimed they were fighting against mainland China’s capitalist power and defending Taiwan from having its status “lowered.” But Taiwan is already a member of the Asian Development Bank (ADB) under the name of Taipei, China. There are diverse differences between populist trends in Hong Kong and Taiwan, but two common points stand out: an emphasis on upholding local and independent identities, plus a push for “desinicization.” In some extreme cases, a few radical Hong Kong students waved the British colonial flag of Hong Kong. Meanwhile, “Formosa,” a Portuguese term for Taiwan, seems to have gained a certain degree of popularity in Taiwan. Is there democratic substance in these populist trends? Populism does reflect appeals from the grassroots and vulnerable social groups. However, it can also be manipulated for political benefit. When populism begins to be exaggerated, the consequences may reveal a gap between the democratization process and the real democratic substance in some East Asian societies.